Earlier this year, the 2013 South By Southwest Interactive Festival took place. It wasn’t the first of these kinds of events this year though. In late February I had the pleasure of keynoting at Europe’s equivalent in Oslo, Norway. The By:Larm music conference is well established and extremely popular. 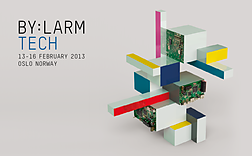 This was the first year they decided to run the technology conference alongside, called By:Larm Tech. I’ve spoken at many similar events, and found it can be tricky to get the technical balance right. If I go too deep I’ll lose some of the audience that don’t care so much for the technical nitty-gritty. On the other hand if I stay too high-level I’ll bore the techies in the audience. I decided to start with a story, then talk about Evernote’s approach to app development, and finally talk about how you can build on Evernote’s success by taking advantage of the Evernote’s platform to build apps that integrate with Evernote. The conference organizers were smart. They knew that the audience would have been up late listening to music and drinking. My presentation was one of the first, beginning around 11am. Instead of immediately diving into details of Evernote’s technology platform, I decided to start with a story. Even if you’ve been using Evernote for a while it can be easy to forget the power at your fingertips from Evernote’s search capabilities. Imagine you are out at a restaurant. It’s a great restaurant with great wine. It’s so good that you and your friends are well into your second bottle. In fact it’s so good that you decide you want to remember this bottle of wine for all time, and you know just how you’ll do it. 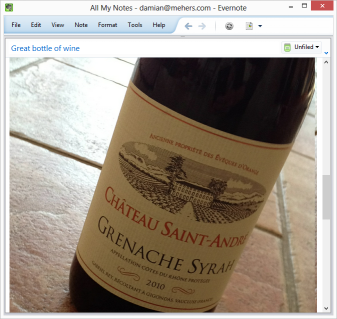 You whip out Evernote on your phone, and take a photo of the label. Given that it’s the second bottle the photo is a little blurred, and not exactly straight. Six months later you are thinking back to that night, and you dimly remember taking that photo. You don’t remember much about the evening, but you do remember that the wine’s name had the word “saint” in it, so you search in Evernote. Because Evernote recognizes the words in photos you put into it, you quickly find the note you took that night, despite the label being blurred and at an angle. 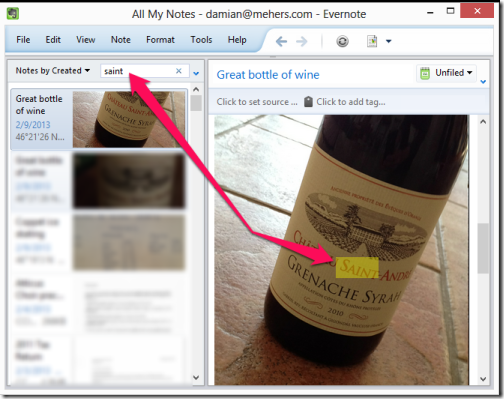 Evernote’s text recognition and image search capabilities are just a couple of many subtle yet powerful features that like beneath the deceptively simple User Interface. As many a student has found to their delight, you can even take photos of hand-written text and Evernote will search it. 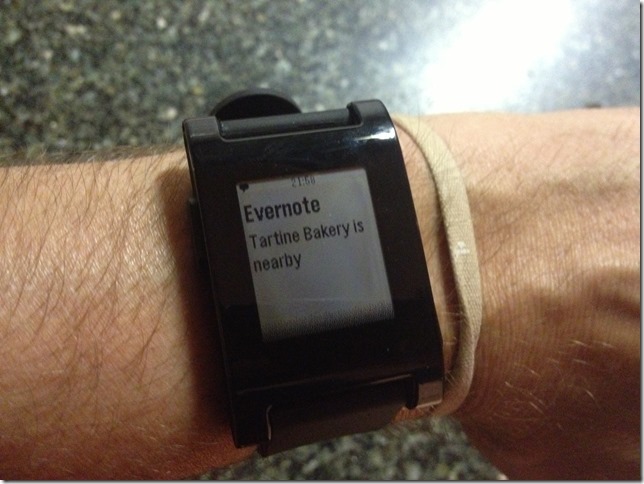 Imagine that: searchable hand-written notes! That’s too easy though. Instead let’s imagine that the night was such a good night that you don’t even remember a word from the label, but you do remember that it took place in Paris. You are pretty sure of that. 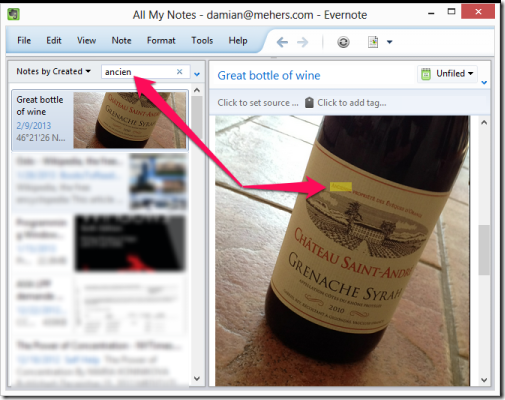 When you take notes on mobile phones, Evernote can optionally embed location information in the note. 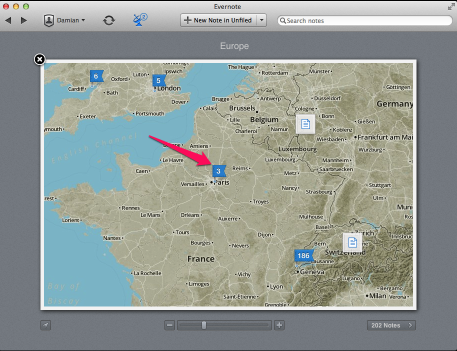 Instead of searching for text, you can view your notes on a map, using the Atlas feature in Evernote for Mac, and quickly zoom in to the notes you’ve taken in Paris. Being able to quickly and easily capture notes is one half of the story. Even more important is being able to find your notes later, whether by searching for content, or by drilling down to when or even where they were created. If you are looking to build great apps that integrate with Evernote, its worth understanding Evernote’s approach to app development. In two words: Experience First. I’m mildly allergic to meaningless buzzwords, but this concept actually makes sense. What does it mean? It comes down to creating an experience that people will love, that they will come back to time after time. It emphasizes ease of use, especially for first time users. 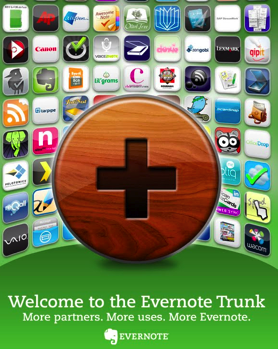 We focus on the overall experience of using an Evernote app. To do this Evernote invests very heavily in design, and we create native apps for most OSes, whether it’s Android, Windows Phone, or iOS. We want an app that feels native, and takes advantage of each platform’s unique capabilities. It pays off. 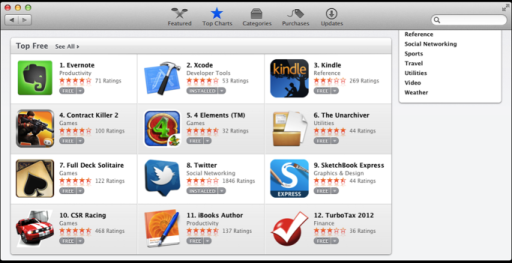 The day before the presentation I looked into the various app stores and found we were the top free app in the Mac App Store, an Editor’s Choice in the Google Play Android store, recommended by Apple for new users in the iOS store, and listed in the top free apps on the Windows 8 store. This doesn’t happen by accident. It’s not just about features or looking pretty. It comes from a relentless attention to getting the overall experience of using our apps as great as possible. When you are building apps that integrate with Evernote you want to benefit from the “hallo effect” of Evernote’s popularity – invest in design. Before I joined Evernote I was an Evernote user. I wanted to create my own Evernote client to do some things the standard Evernote client I was using didn’t do. Being a hacker at heart, I delighted in thinking about how I’d have to reverse-engineer the Evernote API calls, to understand how to interact with the Evernote service. You can only imagine my disappointment when I discovered that Evernote provides a public API, and extensive documentation and support to help you successfully build on the Evernote platform. 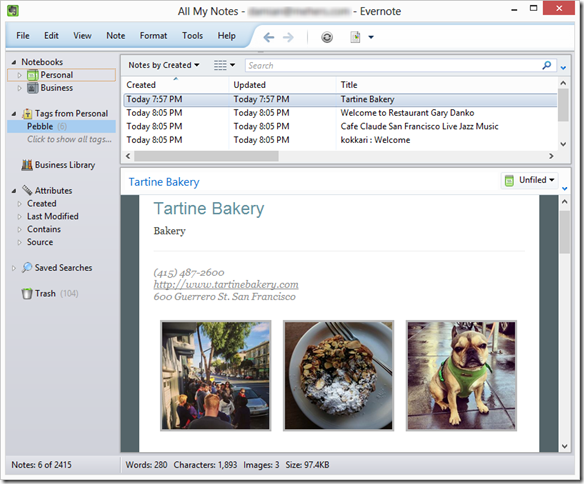 When you look at Evernote’s client apps, such as the Mac or Windows desktop clients, or the Android or Windows Phone mobile clients, it’s tempting to think that those apps can only work the way they do because they were created by Evernote. You’d be wrong to think that though. Evernote’s apps use the same public API as everyone else. There are no secret API calls available only to Evernote. 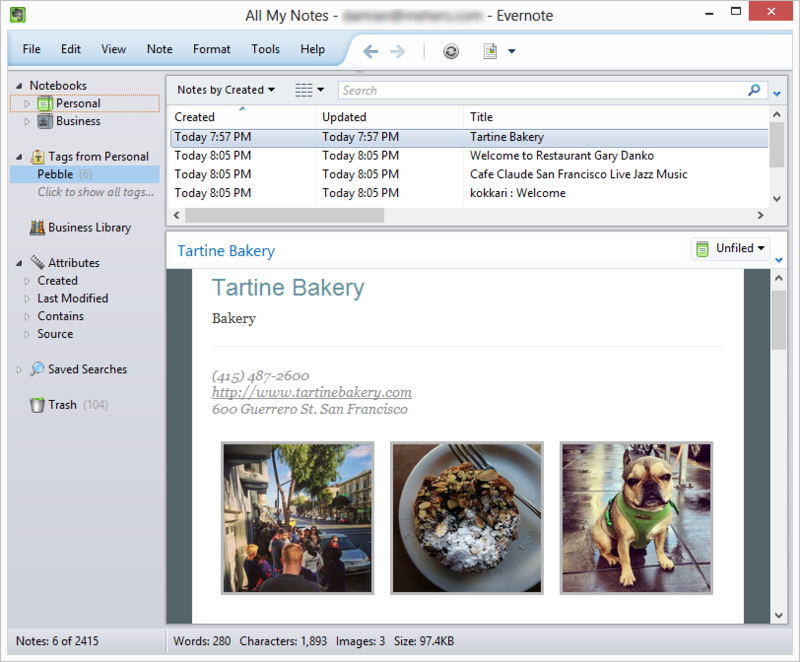 There are many reasons why you’d want to build an app that integrates with Evernote. 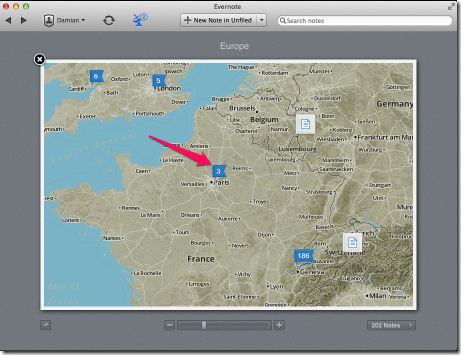 Perhaps your users want to be able to export and import their information to their Evernote account. 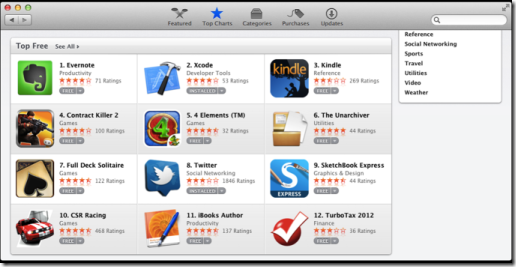 Most likely you want to take advantage of the 50 million or so Evernote users. You have several Evernote integration points to choose from. The right one for you depends on what your app does. You can create a web site that in turn talks to Evernote’s service API, or you can create mobile or desktop apps that talk to Evernote’s API. Alternatively your apps can talk to Evernote’s Apps. This can often be much easier and quicker to implement. For example on Android your app can send Android messages called Intents to the Evernote Android app to ask it to create a note on your behalf. The Evernote Trunk is a great please to see what kinds of apps people have already created, and it’s where you can get Evernote to showcase your app, once you’ve built it, if you want to. How does Evernote make money by offering a free service? Evernote is free to use, however if you do want to take advantage of additional features, such as storing your notes offline in our mobile apps, then you can pay for a premium subscription. You don’t have to, and you should never feel any obligation to do so, but it’s well worth checking out the Evernote Premium features since it’s pretty compelling. We have also started an Evernote Business offering. Evernote Business lets you use Evernote as you always have done, with your stuff staying private in your own notebooks, but it adds Business Notebooks that belong to your company. Suddenly your “external brain” is expanded to include everyone in your company, making it easy to share and discover information previously locked away in your colleagues’ minds (or files). I’ve only scratched the surface of what I covered, but overall the presentation seemed well received. I was asked several times afterwards to tell the wine story by people that were not at the presentation but heard about it afterwards. I did get the feedback that I was “eulogizing” Evernote. It means “to speak or write in high praise of”. Guilty! Many thanks to Cristina Riesen, Director Market Development Europe at Evernote, and Torgeir Waterhouse, Director Internet & New Media at IKT-Norge for giving me the opportunity to speak at By:Larm Tech. Damian is a Senior Software Engineer at Evernote, based out of Geneva, Switzerland. He created the original Evernote Windows Phone client, and works on Evernote Food for Android. He has founded and eventually sold several successful software product companies, and loves the magic that is programming: turning something imagined into something real. This entry was posted in Evernote on March 25, 2013 by damian.